my fav part is when garrison said "i just wanted to see the look on your face when we told you"
Selling candy at fat camp? Sound like a hell of an idea. Did you like the old one..? 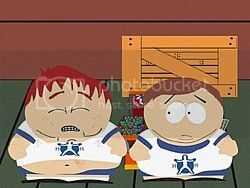 Kyle: Dude, I don't know if I'm going to like the new Eric Cartman..
Stan: Did you like the old one..?